Get first-class driving tuition in the UK’s second city. Click here to learn all about our driving courses in Birmingham. Ready to start driving in the home of motor manufacturing? Read up on the driving courses PassMeFast offers in Coventry. Our courses in the Dudley area—including Halesowen and Stourbridge—can help you to pass your test in weeks. Find out more here! Learners in Solihull: are you ready to get your licence fast? We can help! Read up on our driving courses in the Solihull area here. Whether you’re in Walsall or Willenhall, Bloxwich or Brownhills, we’ve got a driving course to suit you. Learn more about our Walsall courses here. Click here for more information about our driving courses in West Bromwich and across the borough of Sandwell, including Wednesbury, Tipton, Smethwick, Rowley Regis and Oldbury. 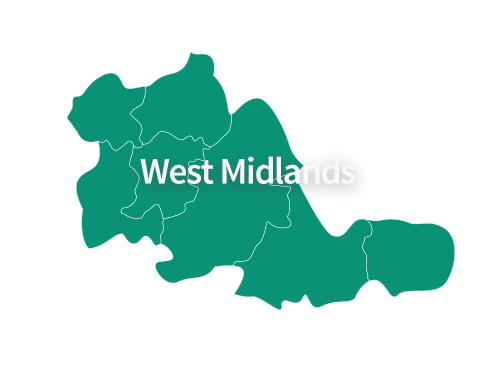 Click here for more about our driving courses in Wolverhampton, which can help even a total novice become an experienced driver within a matter of weeks.